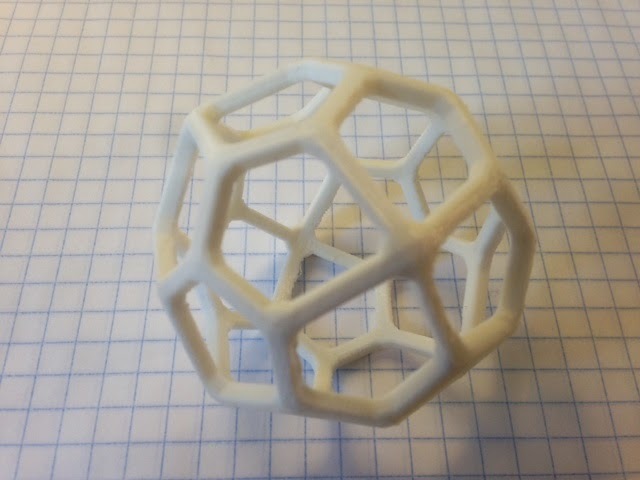 Today's print is yet another Catalan solid, the Pentagonal Icositetrahedron - dual of the Snub Cube which we printed with Poly-Snaps in Day 116, and giraffe-cousin of the Pentagonal Hexecontahedron we printed on Day 194. Designed using Mathematica, MeshLab, and TopMod as described in Day 194, with scaling factor determined as described in Day 195. Settings: Same as the past few days, detailed in Day 194, on a Replicator 2.